This article details the various additions and improvements that can be found within our InstantKB 2016 release. Added automated version history for all articles allowing you to see a complete history of all changes made to article text. The new version support also introduces a visual diff gram allowing you to compare 2 versions of the same article side by side. 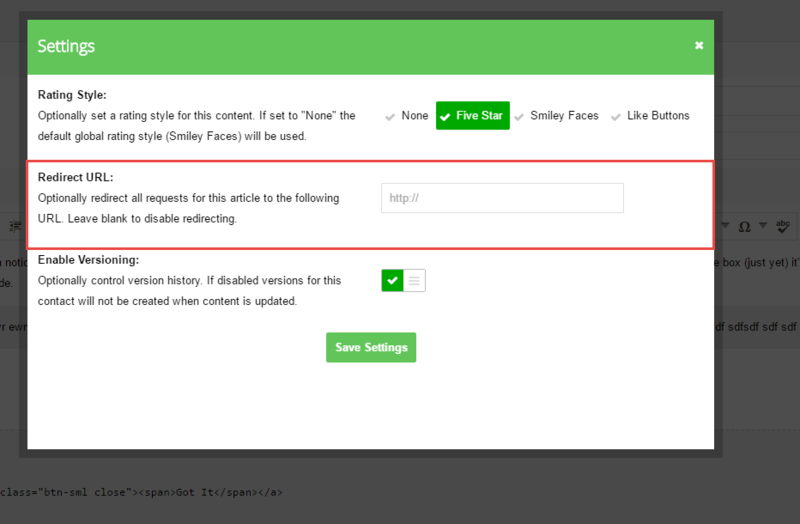 Additionally you can now also roll back to any previous version of an article or preview previous versions. Article Redirects allow you to now specify a redirect URL for any article within InstantKB. This allows you to redirect users to specific pages on your web site or within existing documentation when they click an article link within your support center. You can now globally set the rating style for contact within your support center. 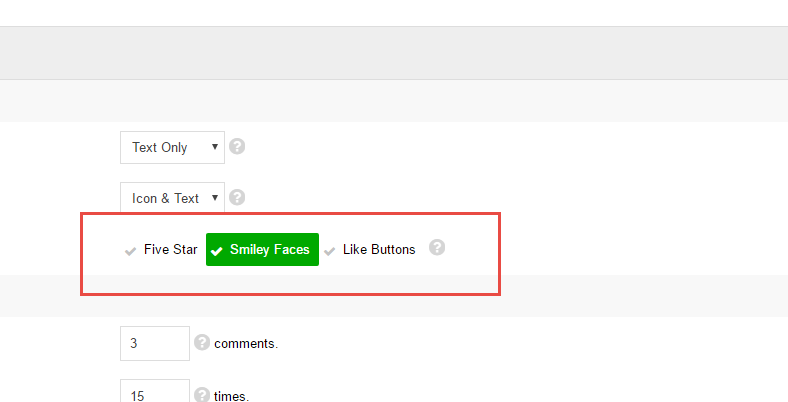 5 star, smiley faces or like buttons. This will become the rating mechanism for all new or existing articles. You can still override this rating style on a per article basis if needed. Added auto-linking to header tags within articles. Any header tag (H1, H2, H3 etc) within an article will now have a small link icon to the right allowing you to anchor or provide a link to that section of the article. This works for bot regular knowledgebase articles and articles within our documentation view. Similar to popular search engines if you miss-spell words when performing a search InstantKB will now show a "Did You Mean" suggestion panel offering the correct spelling for your search query. - Searching for only a number will now return the article or ticket with that ID along with any other tickets or articles with the number in the title or body. - Searching for email addresses within the Agent CP should now only return results with that full email address. Previously emails were broken up causing unexpected results. Improved issue creation. When creating new issues you'll be presented with 3 options ( New Issue, Private Issue, Shared Issue. A new issue will simply allow you to create an issue not associated with any contact. A private issue will allow you to create an issue related to a contact but never shared or visible to the contact. A shared issue allows you to create an issue you can share with a contact via email or the web interface. The previous UI for this was a little confusing and we hope you'll find this more streamlined. Added new real-time in-app notifications within the Admin & Agent dashboard to notify support agents as new issues across any issue tracking tab arrive via any inbound support channel (web, email, phone & social) into InstantKB. Whilst we automatically track the time you spend responding to customer questions we've now also added the ability for you to manually edit time worked when reposing to issues if needed. To edit the time worked simply pause the automated timer. 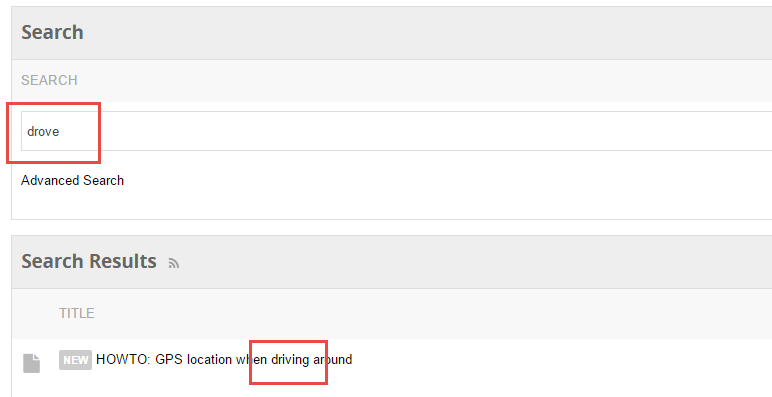 We've added the ability to manually set a due date for issues. Due dates can still automatically be set based on the service level agreement associated with the issue via inbound rules. 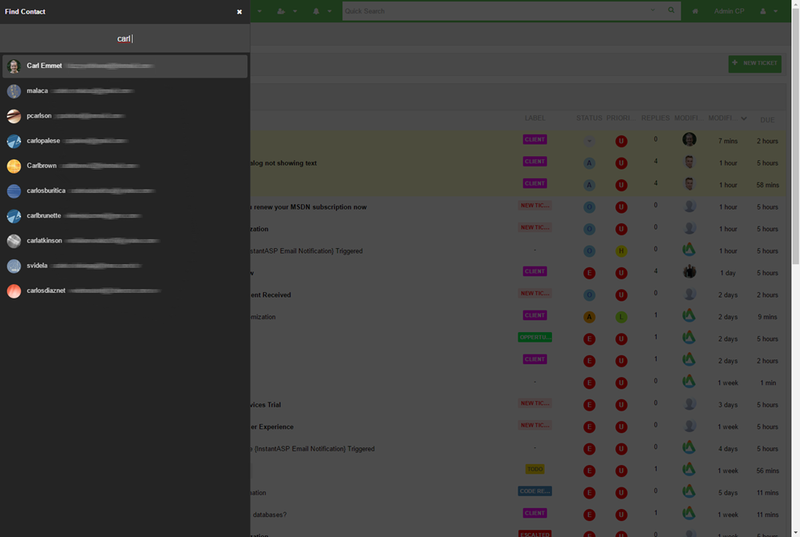 We've added the ability to easily manually label a single or multiple issues. Labels can be used to help you organize your issues. 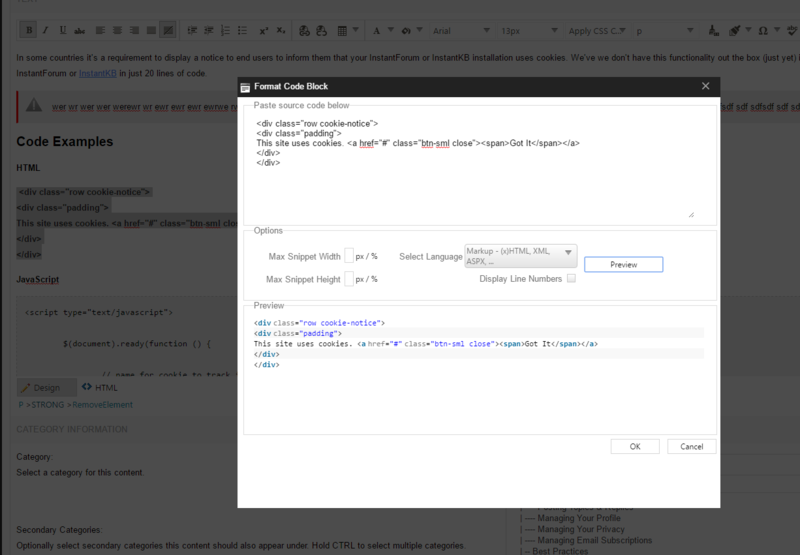 You can of course still automate labels through inbound rules, workflows or escalation rules. 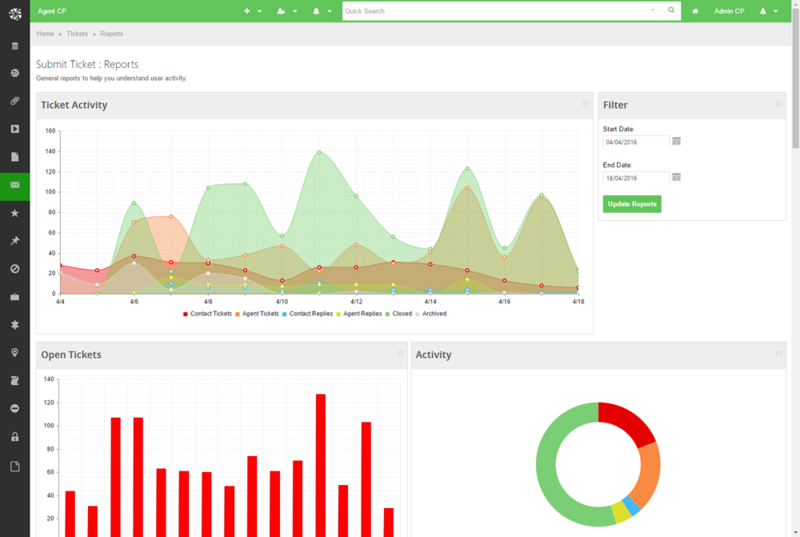 We've added the ability for customers to escalate there own issues via the web interface. When a customer escalates an issue the due date for that issue will be set to the date the customer escalated the issue. 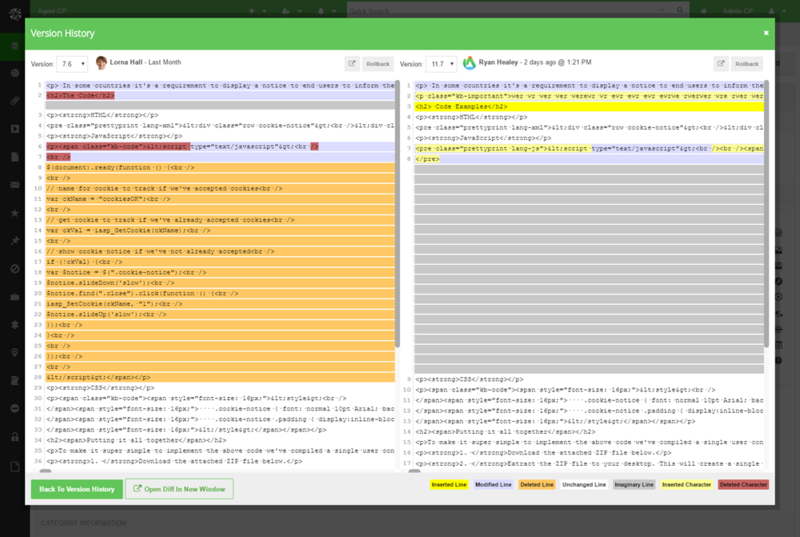 This will cause any escalation rules you have defined within InstantKB to execute against the issue triggering any additional notifications to support agents. We've added the ability for customers to close there own issues via the web interface. This will ensure the issues is removed from your agents open issues list. 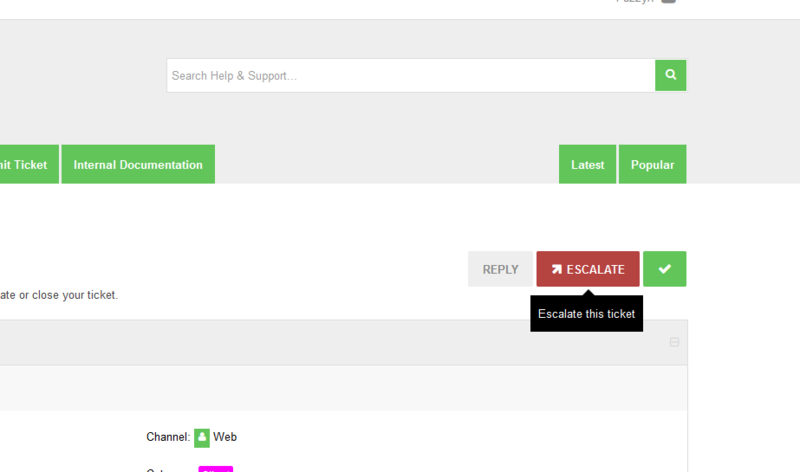 Several improvements to ticketing UI for support agents and end users when submitting new issues (tickets) & replies via the web interlace. Changed categories to labels for issue tabs. 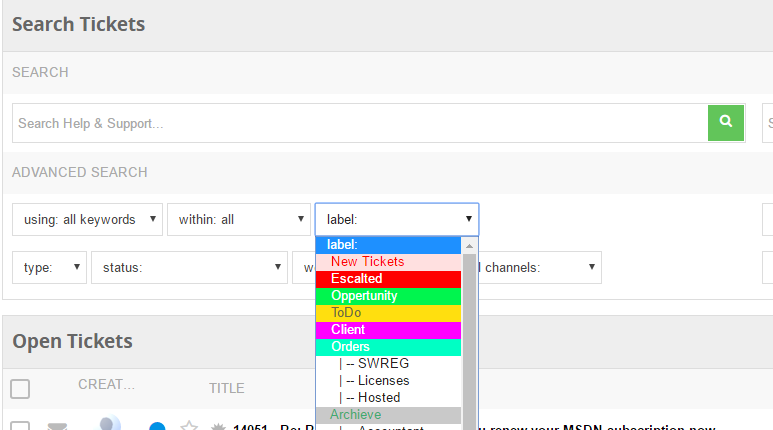 Added ability to now color code labels within issue tabs. Added support for sending email file attachments. When sending a new issue or ticket to a contact via email or replying to an email via the web interface any files you attach to the ticket will now also be attached to the email sent to the contact. Added quick search for contacts. This allows you to quickly search for a contact by email, name, company or phone number from any agent or administrator control panel page and quickly jump to a contacts profile. We've introduced a new ranking system for contacts based on inbound and outbound support activity. This helps you easily identify your most active contacts or those contacts that are asking the most questions. This ranking has decay and will diminish overtime if the contact does not remain active or other contacts are most active. 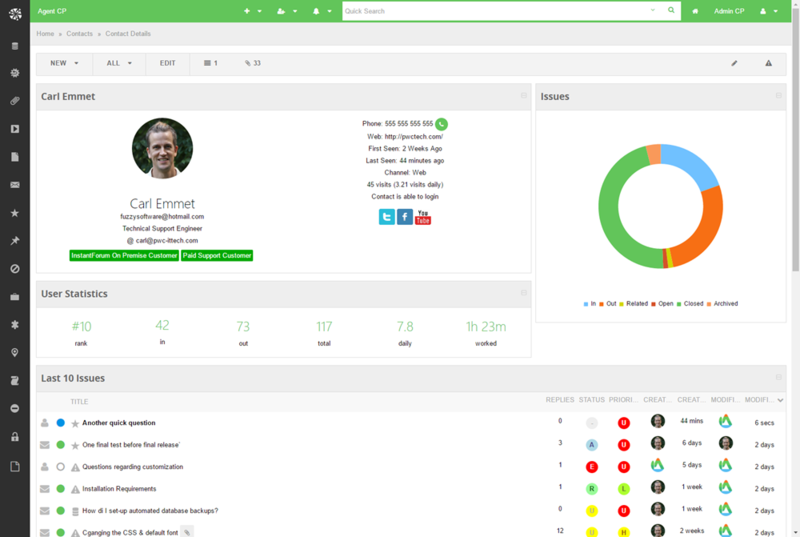 We've also streamlined & consolidated the existing statistics shown for each contact on the contact profile page and added a new report for each contact showing you received v's open v's closed issues. This helps you easily identify if a particular contact is receiving an acceptable level of support. We've added ability to import public profile photos from social services. You can now search Gmail or Gravatar for a contacts public profile photo and use this for your contact within there InstantKB profile. Added ability to define precise and fuzzy matching of subject lines within inbound rules and escalation rules. Added ability to execute escalation rules indefinitely. If an service level agreement (SLA) is associated with the escalated issue the due date for the issue will be reset each time the issue becomes overdue based on the SLA response time. This can be helpful if you wish to ensure items remain at the top of your open issues list until they are marked as closed. Added ability to separately remove issues from archive within both inbound and escalation rules. The existing "Open Issue" option will now only move issues from the Closed issues list but won't remove them from the Archived list. Improved attachment view accessible from side bar when viewing an issue. File attachments are now sorted chronologically with the most recent appearing at the top. We've also added a date field for each attachment. Reduced number of database queries required for the homepage sections. and category sections. Only 1 query is required for each section you create. Previously this required a separate query for each category you added to a section. Removed Who's On panel and Open Issues from homepage. Based on feedback the Who's On panel was really not necessary and has been moved to the Staff CP. 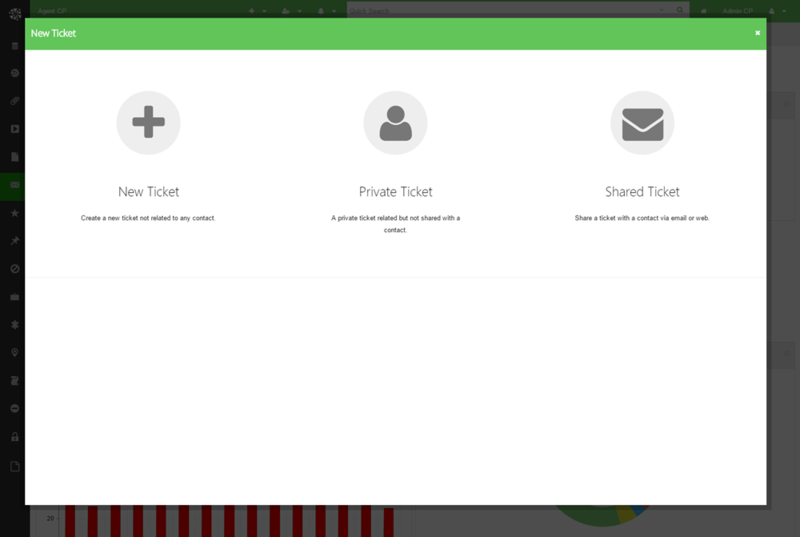 The Open Issues panel has been replaced with the My Tickets panel which provides a link to your tickets. Complete under the covers CSS overhaul to align with new BEM naming conventions and avoid conflicts with other CSS frameworks such as Bootstrap, Milligram etc. In addition all CSS class names now align with InstantForum making the themes interchangeable. Added button to go to category showing total number of articles within category to homepage sections and category sections areas. 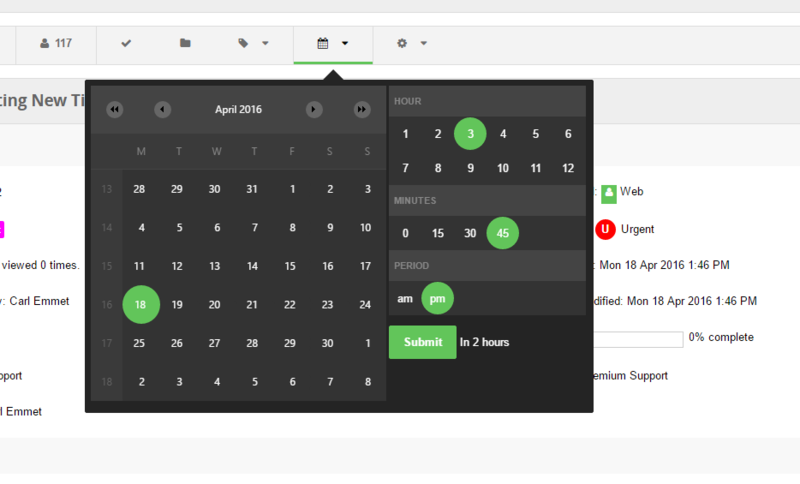 Improved navigation within Admin & Agent areas. Menus now appear on click to avoid accidental hover and improve touch support. Tool tips are also used to show the full option title as opposed to truncating the text within the site bar. 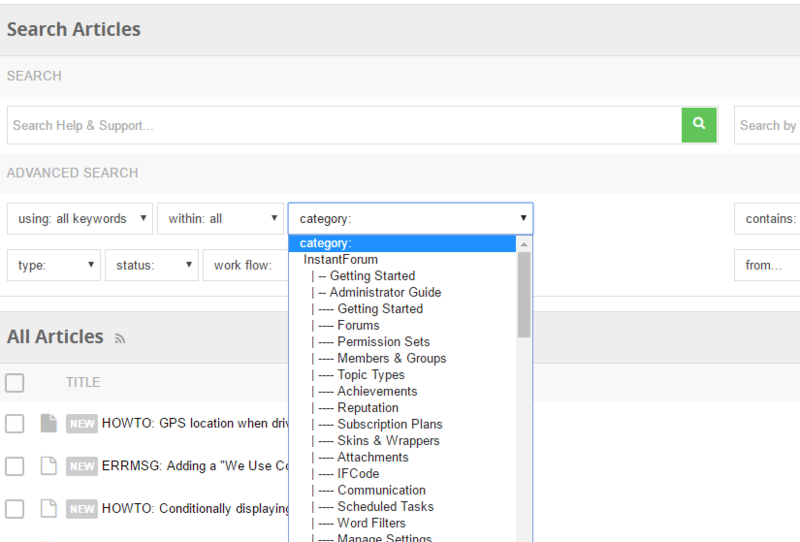 Improved multi-edit & toolbar UI used throughout Manage Articles, Manage Tickets & Manage Contacts. 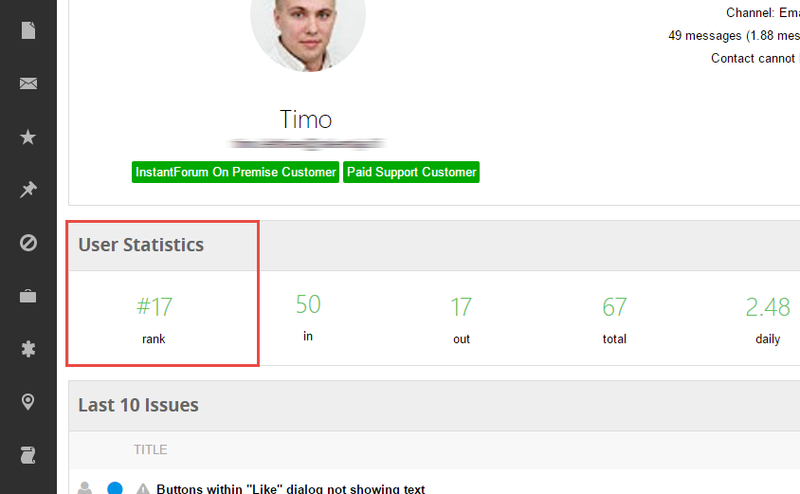 Added new contextual side bar only visible to support agents to all front-end support pages. This is accessible from a single button in the bottom left of all front-end pages and allows support agents to quickly add articles, edit the current articles or manage categories. Different options will be presented within the side bar depending on the tab or content you are viewing at the time. Added ability to search tab, category & rule icons by keywords. This modal pop-up now also uses the same InstantASP modal dialog as other areas. Added full history / state support for AJAX post backs to Manage Articles, Manage Tickets & Manage Contents pages. State should be persisted on all these pages when performing searches or paging results and using the browser back button. Improved several areas for touch devices. Fixed issues with modal pop-ups and focus / blur events. InstantKB 2016 will now work great on an iPad or even smaller devices. We've addressed dozens of smaller issues with this update. We've improved several text descriptions, fixed a few spelling and grammatical errors and further streamlined the out the box or default experience for new customers.